2 X 12 Wood Floor Register - Unfinished Oak Discounts Apply ! 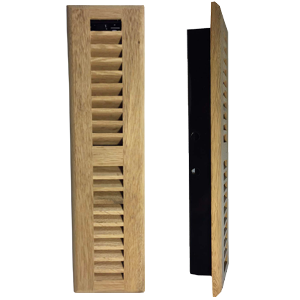 Floor heat registers are crafted with a solid Oak faceplate. Your new air vent covers will arrive ready to stain and finish to suit your style. These floor heat registers feature an adjustable damper for air flow comfort. Air vent covers made of wood will bring a natural warmth and beauty to your home or office. Oak floor heat registers are quality made and value priced. 2 x 12 air vent covers are one step drop-in style installation. ***Hint: When ordering floor heat registers use the actual hole size and not the faceplate cover size of a previous one. Actual Faceplate Dimensions (L x H): 13 1/4 x 3 1/2 inches. Oak floor heat registers are available in many sizes and can even be purchased in the flush mount models. These wooden air vent covers will bring that finished look to your hardwood floors. Order yours today!